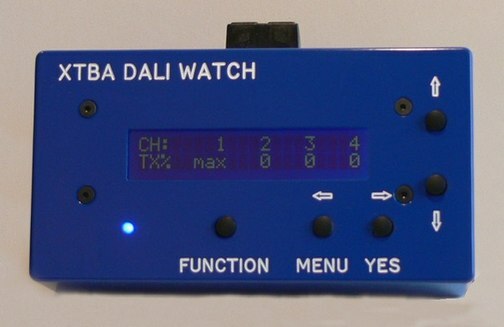 The XTBA DALI Watch is a brand new tester / programmer which is designed to simplify DALI commissioning and/or testing, identify faults, monitor commands and make life a little simpler. So if none of the below makes any sense - don’t panic as the XTBA DALI Watch will help you through muddy waters of DALI – it is not ‘Rocket Surgery’. This tool will help to remove most of the mystery of DALI helping even the beginner to understand what their DALI fittings are doing, and more importantly, how to make them do what you want! The DALI control protocol has been around for over 25 years and has mainly been used in office or architectural settings. But with the increasing use of LED fixtures and DMX/DALI hybrid systems many more DALI fixtures are being installed. Whilst DMX is reasonably well understood and has numerous testers - some good (see the DMXter and MiniDXter pages) and some not so good - search the web for ‘DMX tester’! DALI is a different story. There are a few DALI programmers/testers available. They are expensive, difficult to source, most need a laptop and dongle (difficult to use on top of a ladder) and for the most part difficult to understand let alone use. The XTBA DALI Watch provides all the tools you need in one simple unit, controlled by five buttons and information viewed by a back lit LCD display. If you are used to DALI (and its strange ways) XTBA DALI Watch has all the basic and advanced tools you would need to setup your installation and diagnose problems. 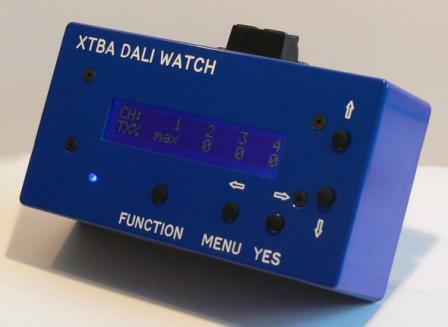 If you are new to DALI and just need to get an installation up and running quickly the XTBA DALI Watch will provide the simple solution. The XTBA DALI Watch functions continue to expand. The existing ‘core’ code has been improved to speed and to simplify the operations. Single device programing has been added. In DALI parameters maximum and minimum bit time is now available and the unit will now halt on a bit time error and display the error either too long or too short. Device Emulation has also been added. Device Emulation in the Development Tools menu allows the Watch to function as a single DALI receiver. The Watch can now be discovered have its short address, max level, min level, group, scene etc. set as if it was a single DALI fixture. All the settings can be viewed in real time on four screen pages. This allows DALI controllers or DALI installations to be fully checked as you can see what is going on in a ‘fixture’s brain’. Receive Levels – View all incoming levels. View Commands Live – View and store incoming commands. View Command History – View previously captured commands. View Raw Data – display of incoming data as two bytes in binary and decimal. Command Compare – look for a single command at and address, group or broadcast. Receive Group Levels – View incoming group levels. Flicker Finder – store all channel levels and look for any differences. Adjust Single Levels – transmit any or all of the 64 levels. Adjust One Level – single control of an addresses level. Adjust All Levels – just that. Global All Levels – transmit to all ignoring and addresses. Adjust Group Levels – transmit any or all 16 group levels. Quick Set Up Devices – Set Max, Min, Power On and Failure Levels. Fade time and fade rate. Advanced Set Up – Access to all DALI commands at short address, group or Broadcast. Discover/Program All – Discover fixtures and program addresses. Discover/Program New – discover and program newly added fixtures. Patch Devices – alter addresses. Remove Short Address – just that. Set Up Scenes – just that. Check Fixtures – compare all fixtures and count active fixtures. Look for the following and display result at an address. Max Level, Min Level, Power On Level, Fail Level, Ballast, Failure, Lamp Power, Limit Error, Reset State, Version Number, DTR Level, Device Type, Power Fail, Actual Level. DALI Bit Time/Word Time, Interbyte Time, DALI Word Range, Frame Time, Framing Errors, DALI Input Voltage, Device Response Time. Decimal or percent – show values in either format. Level Commands On/Off - Block incoming levels - show commands only. Block Repeat Data On/Off – only show new received levels or commands. Display Find – Set the display of the fixture in discovery, patch etc. Advanced Menus On/Off – remove less used menu items. For more details including the exclusive XTBA "Quick Start" guide to DALI please see the manual.